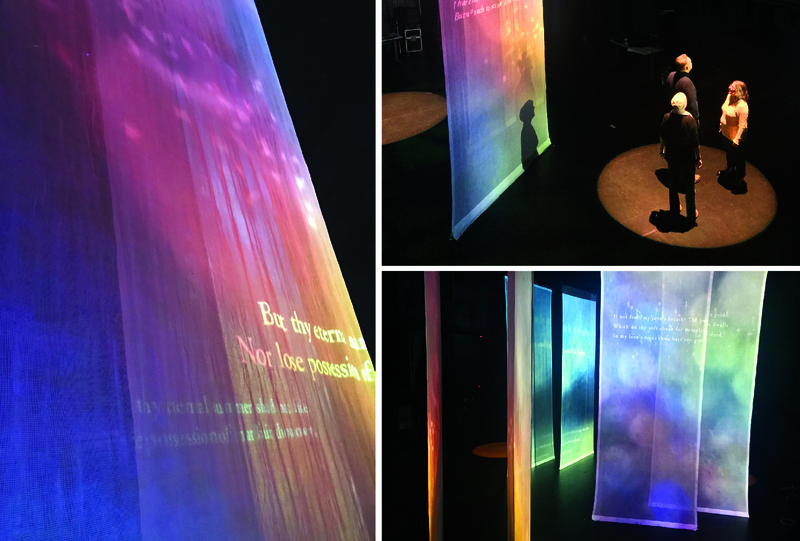 Using spatial audio and flexible video projection, a team created an immersive typographic Shakespearean experience to reimagine traditional theater. My role was to create a series of motion graphics, designed to work together in an installation alongside audio recordings (utilizing both spatial and locational audio). Each piece uses the text from selected Shakespearean works (including passages from a Midsummer Night’s Dream, As You Like It, and Merchant of Venice as well as Sonnets 12/ 18 / 73/ 98 / 99 /130) to create engaging visuals, which were projected onto a series of hanging scrims. During performances, audience members follow a meandering path through the installation, actively engaged in their own exploration of Shakespeare’s garden. The aim of this project was to explore ways of bridging the physical and digital domains for both art and design. This project was a pilot for future exploration and experimentation in immersive theater, and was exhibited at the Cube (a four-story state-of-the-art theater) March 22–24 of 2018, with over 1,000 attendees.